Aline Sax’s novel The War within These Walls (illustrated by Caryl Strzelecki and translated from the Dutch by Laura Watkinson) has been named a 2014 Batchelder Honor Book by the American Library Association. The Mildred L. Batchelder Award is given annually to an outstanding children’s book originally published in a language other than English in a country other than the United States and subsequently translated into English for publication in the United States. The 2014 award and honor winners were announced this morning at the ALA’s Youth Media Awards ceremony in Philadelphia, Pennsylvania. Heavily illustrated with Strzelecki’s sober blue-and-white drawings, The War within These Walls dramatically captures the brutal reality of life in the Warsaw Ghetto and the failed Jewish uprising that took place there. Read more about this honor on EerdWord. 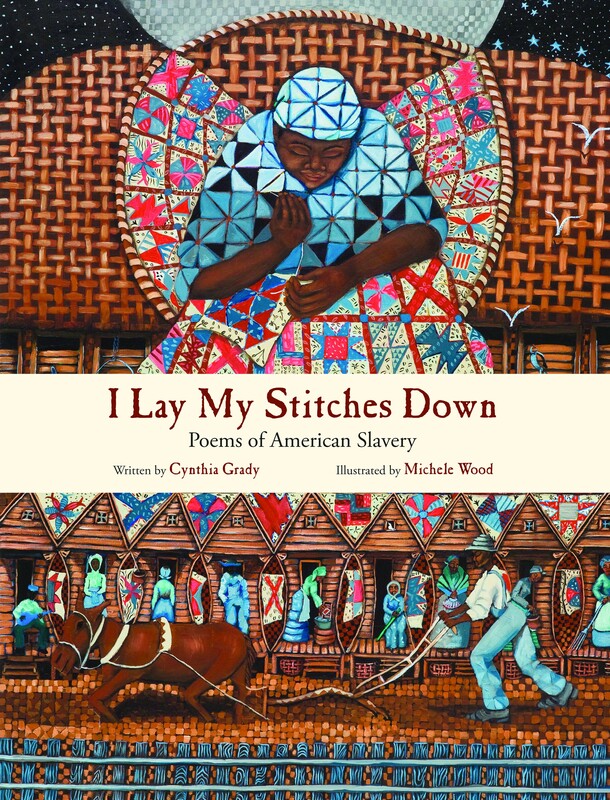 Cynthia Grady and Michele Wood's I Lay My Stitches Down: Poems of American Slavery has been selected for inclusion on the National Council of Teachers of English (NCTE) Children's Literature Assembly's 2013 Notable Children's Books in the Language Arts. The Children's Literature Assembly of the National Council of Teachers of English advocates the centrality of literature for teaching children. 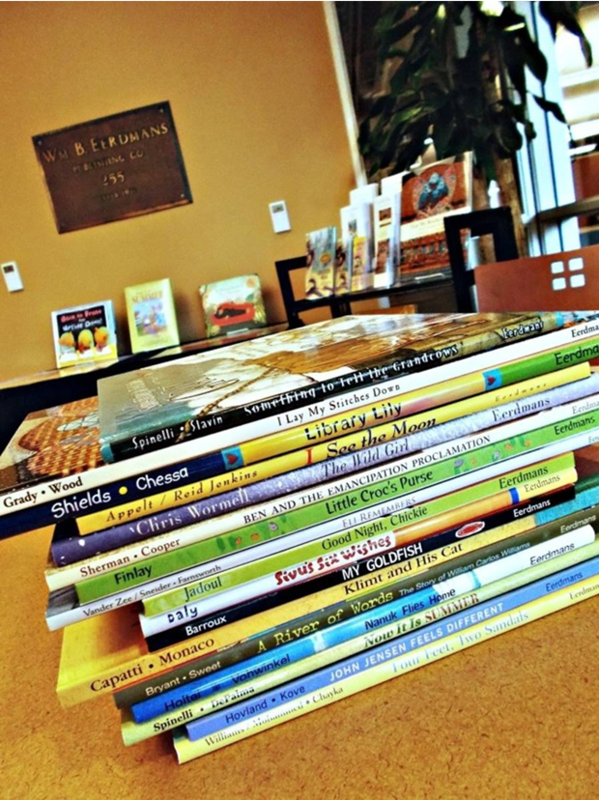 They believe every teacher needs a wide and extensive knowledge base of books published for children and young adults. Two titles from Eerdmans Books for Young Readers were honored at the American Library Association’s 2013 youth media awards ceremony, held during the association’s annual Midwinter Meeting January 28 in Seattle, Washington. 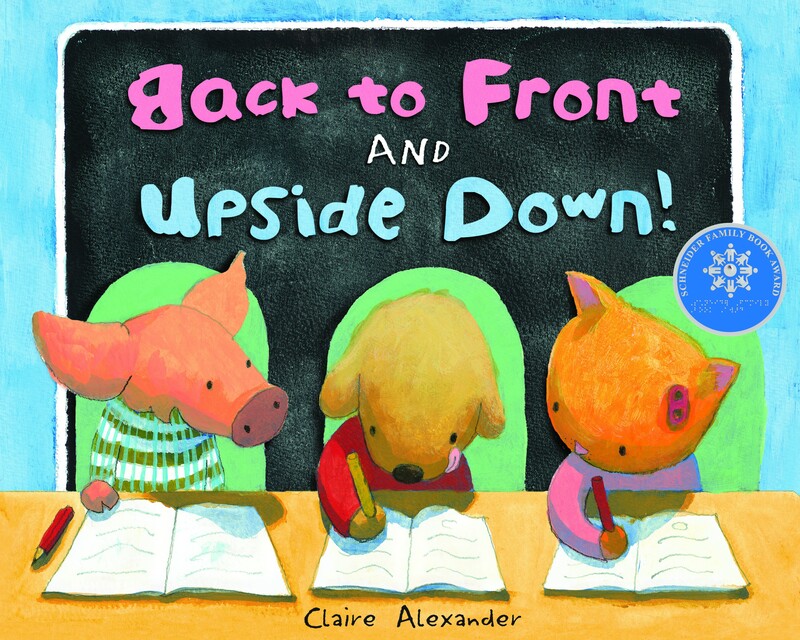 Claire Alexander’s Back to Front and Upside Down won the Schneider Family Award, which recognizes books that embody an artistic expression of the disability experience, for children ages 0-10. Back to Front and Upside Down tells the story of an beginning writer named Stan, who is frustrated when his letters come out all in a muddle  “back to front and upside down.” Stan is afraid to tell the teacher his trouble, until a friend assures him that nobody’s good at everything and that everyone has to ask for help sometimes. Anne de Graaf’s Son of a Gun was selected as one of two Batchelder Honor books. The Mildred L. Batchelder Award is awarded annually to an outstanding children’s book originally published in a language other than English in a country other than the United States and subsequently translated into English for publication in the United States. Son of a Gun tells the powerful and gripping story of a brother and sister, eight-year-old Lucky and ten-year-old Nopi, who are kidnapped from school and forced to become child soldiers in Liberia’s fourteen-year-long civil war. 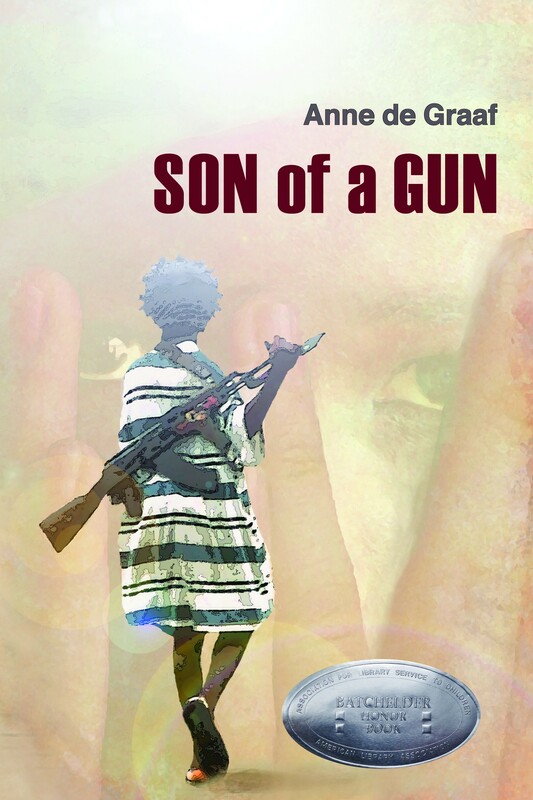 A sensitive and compelling narrative based on true stories of former child soldiers interviewed by the author, Son of a Gun also includes a section of notes and further information about Liberia. Click to order Claire Alexander’s Back to Front and Upside Down and Anne de Graaf’s Son of a Gun. To learn more about our ALA award winners, check out . . . The ALA's press release "American Library Association announces 2013 youth media award winners." Editor Kathleen Merz's 2012 EerdWord post "Soldier Bear, the Batchelder, and the Risky Business of Publishing International Literature." Rachel Bomberger's EerdWord Review of Son of a Gun. The websites of Claire Alexander and Anne de Graaf. Ulrich Hub’s Meet at the Ark at Eight has won the 2012 National Jewish Book Award for Children’s and Young Adult Literature. Meet at the Ark at Eight tells the story of two penguins who learn that a great flood is coming to destroy the earth  and that they are the only two penguins who have been chosen to board Noah's Ark. The two penguins decide, however, to smuggle their friend aboard in a suitcase, and a wild forty-day journey ensues. This creative twist on the classic biblical tale encourages readers to ask questions about God, though it never presumes that the answers will be quick and easy. Ulrich Hub's humorous, yet thought-provoking retelling of this well-known Bible story is complemented by Jörg Mühle's witty illustrations. The National Jewish Book Award is sponsored by the Jewish Book Council, a non-profit corporation chartered New York. It is supported, in large part, by dedicated and interested individuals and foundations in the Jewish community. The Jewish Book Council is the only organization in the organized American Jewish community whose sole purpose is the promotion of Jewish books. Two picture books from EBYR have been selected for the New York Public Library's "Children's Books 2012: 100 Books for Reading and Sharing" list. I Lay My Stitches Down: Poems of American Slavery (Cynthia Grady; illustrated by Michele Wood) was listed in the Poetry and Song category. 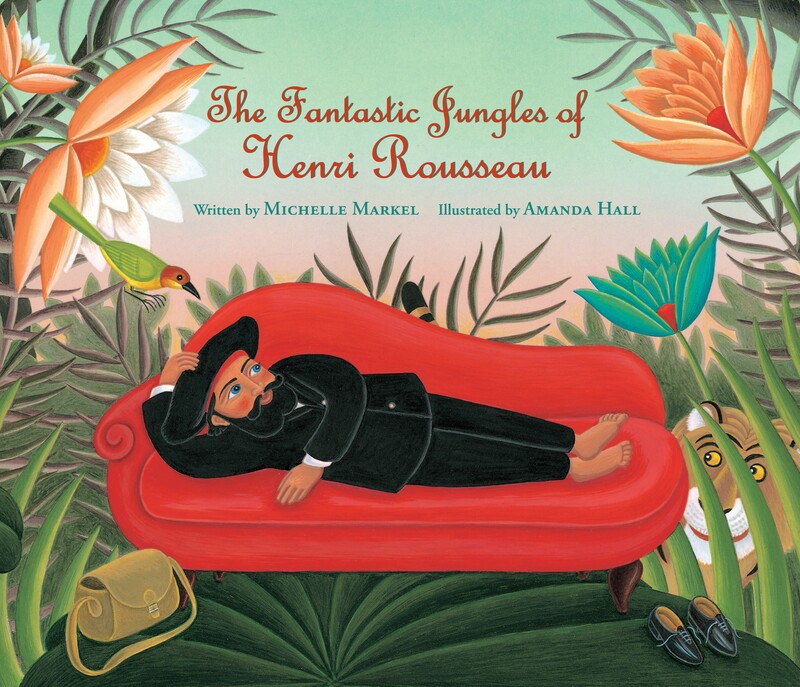 The Fantastic Jungles of Henri Rousseau (Michelle Markel; illustrated by Amanda Hall) was included in the Nonfiction category. This list includes titles published within the year that NYPL librarians believe will have great appeal to their many diverse readers, ranging in age from birth through 6th grade. This list features seven categories and is only a small sampling of the many books the city’s librarians read and loved this year. To learn more or to see the full list of books, visit the NYPL website. Booklist recently included Michelle Markel and Amanda Hall’s The Fantastic Jungles of Henri Rousseau on its 2012 Top 10 Arts Books for Youth list. The book-review magazine, published by the American Library Association for more than 100 years, explained its choice by saying, "The career of artist Henri Rousseau gets a wonderfully child-friendly treatment in this picture book that captures both his personality and the essence of his naive-style paintings." To celebrate the picture book Bow-Wow Wiggle-Waggle, a book about both play and wordplay, author/illustrator Mary Newell DePalma and Eerdmans Books for Young Readers are giving away an adorable red ball to anyone who records a quick video of a read-aloud of the book. Visit Curious City (which is coordinating the giveaway) or the new Bow-Wow Wiggle-Waggle Facebook fan page to learn more. Amanda Hall's original art from The Fantastic Jungles of Henri Rousseau has been honored by inclusion in the 2011 Original Art exhibition of the Society of Illustrators. "The Original Art: Celebrating the Fine Art of Children's Book Illustration," will be on display at the Museum of American Illustration at the Society of Illustrators in New York City from October 24 through December 22, 2011. The book is one of 139 books to be featured in the show. For more information, visit the Society of Illustrators website. The Fantastic Jungles of Henri Rousseau has also been singled out to receive starred reviews from three major periodicals: Publishers Weekly, School Library Journal, and Booklist. A fourth review, from Kirkus, though not starred, also offers high praise for the book, calling it "a charming, affecting picture-book life of France's most celebrated naive painter." With profound sadness, Eerdmans Books for Young Readers notes the untimely death of illustrator Patricia Cantor. Pat had recently finished her charming illustrations for Christopher Sat Straight Up in Bed, scheduled for publication on our Spring 2013 list. We had been looking forward to working with her on future projects when we learned the sad news that she was terminally ill. She died on July 17. We greatly regret that Pat did not live to see her last book in its finished form, but we take comfort in the knowledge that this book will exist as a permanent monument to her extraordinary gifts as an illustrator. Teachers, school librarians, and other educators are invited to drop by Eerdmans Bookstore between 9:00 a.m. and 6:00 p.m., Friday, August 10, 2012, for a chance to win a collection of seventeen titles from Eerdmans Books for Young Readers (EBYR) for their classrooms. The first 20 educators to arrive at the store will receive a FREE copy of an award-winning EBYR title. Visitors throughout the day will also be able to stock up on FREE discussion guides and FREE promotional materials including bookmarks, posters, and postcards (while supplies last) and enjoy great deals on a variety of quality books for readers of all ages. The Catholic Press Association included ten Eerdmans titles among its 2012 Book Award winners, which were announced in Indianapolis on Friday, June 22, at the Association's annual Catholic Media Conference. Winning first prize in the Children's Books category was Images of God for Young Children, written by Marie-Hélène Delval and illustrated by Barbara Nascimbeni. The Catholic Press Association explained its choice by calling Images of God "an incredibly inspiring book... Timely, biblically based, and easily understood." Eerdmans Books for Young Readers has won the prestigious Mildred L. Batchelder Award for its English-language edition of Soldier Bear. The Batchelder is awarded each year by the American Library Association to an American publisher for a children's book considered to be the most outstanding of those books originally published in a language other than English in a country other than the United States, and subsequently translated into English and published in the United States. We offer hearty congratulations to author Bibi Dumon Tak, illustrator Philip Hopman, and translator Laura Watkinson, as well as to the editorial staff of Eerdmans Books for Young Readers for this stunning achievement. Cynthia Grady and Michele Wood's I Lay My Stitches Down: Poems of American Slavery has been receiving critical appreciation from several notable sources. Kirkus Reviews has awarded the book a starred review, calling it "a powerful grouping of thought-provoking poems and brilliantly designed paintings." It has also received a starred review from the School Library Journal, which says, "This ambitious work offers a bit of poetry, history, folk art, quilting, religion and more. It will definitely fill a niche in libraries." Even the Horn Book magazine has chimed in, calling the book "a stunning achievement for both author and artist." Illustrator Carll Cneut has been honored by inclusion in the 2011 Original Art exhibition of the Society of Illustrators. "The Original Art: Celebrating the Fine Art of Children's Book Illustration," will be on display at the Museum of American Illustration at the Society of Illustrators in New York City from October 26 through December 29, 2011. Cneut's Willy is one of 150 books to be featured in the show, which were chosen from 590 entries submitted nationwide. Two Silver Medals and one Gold Medal will be awarded by the jury for outstanding achievement in children's book illustration. For more information, visit the Society of Illustrators website. The work of illustrator Michele Wood will be on display at the Jeffrey R. Krull Gallery at the Allen County Public Library in Fort Wayne, Indiana, September 1October 23, 2011. "Not to Be Forgotten: Paintings, Original Illustrations, & Textiles of One Artist's Journey" features original artwork from three of Wood's children's books, including her forthcoming I Lay My Stitches Down: Poems of American Slavery. The Gallery will host an artist's reception and book signing Saturday, October 22, 24 p.m.; Wood will also be a featured speaker at the National Black Genealogy Summit, held October 22 at the Grand Wayne Center in Fort Wayne. Visit the Gallery website for more information. We've made a few changes to our submission guidelines. Please see our submissions page for details. Spoken Arts has produced an audiobook version of Pat Sherman and Floyd Cooper's Ben and the Emancipation Proclamation, read by the famous actor LeVar Burton. Visit SpokenArtsMedia.com to order your copy. Tim Ladwig's beautiful book, The Beatitudes: From Slavery to Civil Rights, has been named one of the Top 10 Religion Books for Youth by Booklist magazine. See the full list of award winners at BooklistOnline.com.